A new edition of one of the top knitting primers on the market Teach Yourself VISUALLY Knitting has been one of the top knitting primers on the market since its publication five years ago. 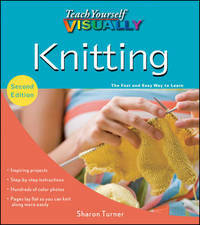 Now, updated with brand-new patterns, even more helpful photos, and expanded coverage of knitting techniques, Teach Yourself VISUALLY Knitting, 2nd Edition, is the go-to knitting book for crafters who learn faster by seeing and doing than by wading through tedious instruction books. You'll get visual guidance on the basic knit and purl stitches and advance to bobbles, cables, lace, and fancy color work. Photo by photo and stitch by stitch, you'll learn how to knit socks, hats, mittens, sweaters, and more. Concise two-page lessons show you all the steps to a skill and are ideal for quick review Detailed color photos demonstrate each step, and helpful tips provide additional guidance Other titles by Turner: Knitting VISUAL Quick Tips and Teach Yourself VISUALLY Knitting Design Packed with step-by-step instructions and fun, innovative patterns, Teach Yourself VISUALLY Knitting, 2nd Edition, will have you creating masterpieces in no time! 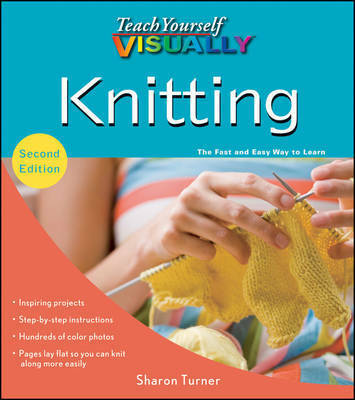 Sharon Turner is the author of Teach Yourself VISUALLY Knitting, Teach Yourself VISUALLY Knitting Design, Knitting VISUAL Quick Tips, Find Your Style and Knit It Too, and Monkeysuits: Sweaters and More to Knit for Kids. She designs vibrant knitwear for children and sells her patterns and kits through yarn stores and online at Monkeysuits.com. She also runs knitting clubs for kids and teens at New York City schools.